A commemorative DVD of the 2005 DCI Classic Countdown, broadcast last night at Regal, United Artists or Edwards Cinemas around the country, is available NOW for $39! "The DVD has all the corps that were on the theater presentation, mixed in 5.1, but with a different mix than in the theater -- mixed philosophically with the same approach as I mix all the current 5.1 DVDs," said Tom Blair, who produced the 2005 Classic Countdown telecast and the DVDs. 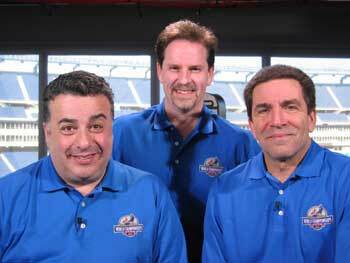 Michael Cesario, Tom Blair and Steve Rondinaro in Foxboro filming for the 2005 DCI Classic Countdown.